Are you as excited to watch the first episode of Highway 18 as I am? Usually, I spend the summers watching reruns of Big Breaks inbetween tournaments and it can get a little repetitive, especially if you are an avid BB watcher who’s already seen all the originals. So I think it’s great that the Golf Channel has come up with another “reality-like” series that pushes our buttons all summer long. I can just hear the comments coming from all the forum members out there sharing their 2 cents on this series – some will love it – some will cheer on favorite players while ragging on others – some will say they hate it because it’s not “real golf”, but then they’ll watch it every week and rant and rave about why they won’t watch it again. But next week…they’re all back. LOL! These shows are just so much fun! Sure, the drama can get a little over the top, but hey…that just gives us more to rant about. But what’s even more fun for me is talking to the participants after each show and hear how they feel about what they experienced and what they thought of the final production. So…just like Big Break Ka’anapali, I’m going to talk to as many of them as I can after each week’s episode and share their interviews with you. I hope you’ll send me questions to ask them as well – always love to hear from you. This week, I am very pleased to be able to kick off the premier with interviews with 3 very memorable people from the show. The first, is the stunningly beautiful and talented, Keri Murphy. Keri is the new host of Highway 18 and she shares a little bit about what we can expect to see over the next 12 weeks on the show. 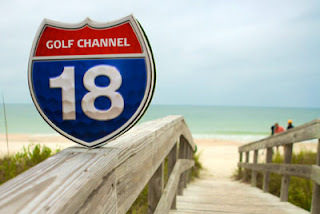 Highway 18 will begin this Tuesday at 10 PM EST on the Golf Channel in the nation’s oldest city where the contestants will meet a “golf legend”. Wonder who that will be? I guess we’ll have to watch and see. And stay tuned…the Ashley/Ashleigh interviews are coming up soon and you won’t want to miss those wacky, crazy gals. Did anyone else notice that one of the Ashleys had a water bottle on the putting green during episode one? This is a rules violation as the clear bottle can be used to read the green. Seriously? I’ve never heard that before. Does it magnify the view somehow? The rule only applies to bottles where you can see the liquid. If you place a bottle on the green, you can use it to help read which way the green slopes, hence which way the putt will break. I’ve reread the rule (14-3) and there has to be intent to read the green, simply placing the bottle on the green is OK.